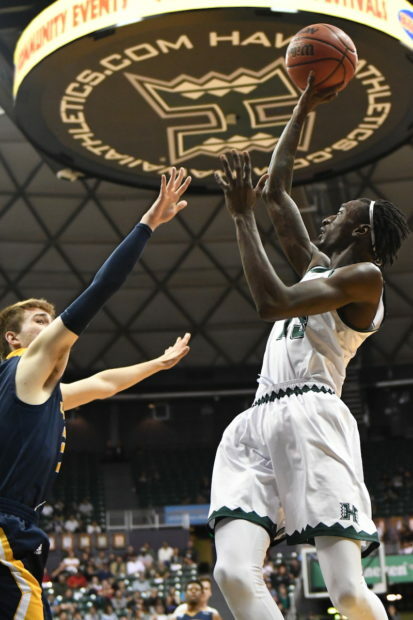 The University of Hawai’i basketball team is in need of a rebound victory to remain in contention near the top of the Big West Conference. UC Davis, Saturday’s opponent, happens to be one of the worst rebounding teams in the country, which could be a good sign for the Rainbow Warriors. Hawai’i will host UC Davis in a Big West game at 7:00 p.m. on Saturday at the Stan Sheriff Center. The Warriors are 11-7 overall and 2-2 in the conference, and looking to snap a two-game losing streak. The Aggies are 5-13 and 1-3. 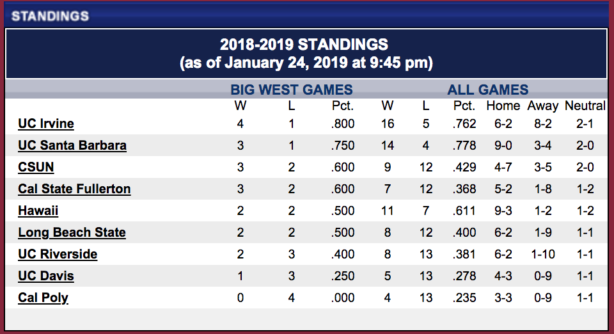 UC Davis, which won the Big West regular-season championship last season, started this season 0-3, but is coming off a 75-63 home win over Cal Poly on January 19. The Aggies have had a full week to prepare for this game at Hawai’i. The Warriors are coming off a heartbreaking 75-74 overtime loss at home to UC Irvine on Wednesday. 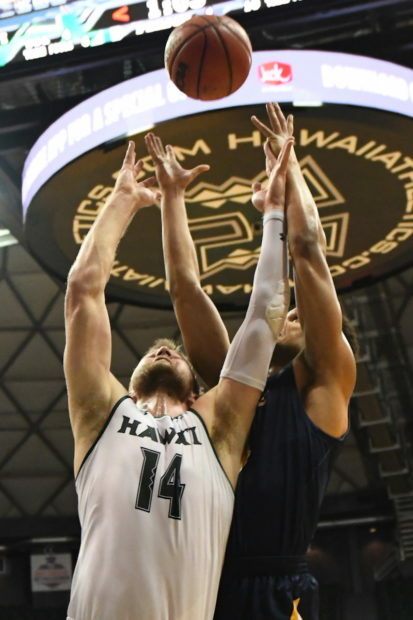 Hawai’i is 9-1 this season when it grabs more rebounds than the opposing team, and controlling the boards against a UC Davis team that likes to slow the pace of games could be crucial. The Aggies rank last in the Big West in scoring (64.4 per game) and rebounding (30.4). But perhaps the most significant statistic is this one: UC Davis is 0-9 in road games this season. The Warriors are averaging 72.8 points and 34.3 rebounds per game, and are 9-3 in the Sheriff Center. Junior guard Eddie Stansberry leads the team in scoring at 13.0 points per game, and ranks second in the Big West for 3-pointers made with 53. Senior forward Jack Purchase has been the team’s most consistent player of late. In UH’s four Big West games so far, he is averaging 17.3 points and 6.3 rebounds per game, and is 13 for 28 from 3-point range (46.4 percent). Overall, he is averaging 12.2 points and 6.3 rebounds per game, and ranks second on the team (sixth in Big West) with 45 3-pointers. Junior forward Zigmars Raimo is averaging 11.5 points and a team-high 6.8 rebounds per game. He also leads the Big West in field goal percentage (.565), and leads the team in steals with 24. Sophomore point guard Drew Buggs is contributing 8.7 points, 5.3 assists and 4.6 rebounds per game. Senior guards Brocke Stepteau (9.4 points, 2.9 assists) and Sheriff Drammeh (7.8 points, 3.3 rebounds) also play key roles. UC Davis remains a dangerous opponent due mainly to the presence of one undersized overachiever. TJ Shorts II, a 5-foot-9 senior guard, leads the Aggies in scoring (14.3), rebounds (5.2) and assists (4.1) and steals (1.6). He is the only player in the Big West who leads his team in all of those categories. He put up similar statistics last season and won the Big West Player of the Year award. Siler Schneider, a 6-3 senior guard, is averaging 11.4 points per game, and is the only other Aggie averaging double-digits. Joe Mooney, a 6-3 junior guard, is averaging 9.2 points per game and leads the team in 3-pointers with 34. The Aggies’ best big players are 6-11 junior center Matt Neufield (6.9 points, 2.7 rebounds, .576 field goal percentage) and 6-7 senior forward Garrison Goode (5.6 points, 3.4 rebounds, .571 field goal percentage). Since joining the Big West Conference in the 2012-13 season, Hawai’i has a 7-6 record against UC Davis, including 4-2 in the Sheriff Center. When: Saturday, January 26, 7:00 p.m. Promotions: Hawaii Pacific Health is the sponsor of Saturday’s “Pink Night” game and will award great prizes throughout the night. The H-Zone store located at Gate B will be selling pink apparel, and fans are encouraged to wear pink in support of breast cancer awareness. Fans can register to participate in the halftime contest at Gate A for the chance to win great prizes. Protect the House Warriors! Pack the arena and support our team, ! Expecting a turnaround game from Eddie and Sheriff!! 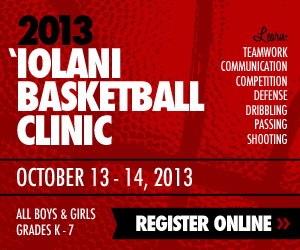 Hit your shots and play tough D the whole game!